In as sense both speak to the importance of doing the good that is at hand, that is, the opportunity that presents itself in the present moment. There it is again: the present moment! The present moment is perhaps the central teaching of Salesian Spirituality. What is its origins in the life of Francis de Sales? I believe it stems from his spiritual crisis as a teenage student in Paris. Calvin’s teaching on predestination was the hot theological topic at that time, even among Catholics. Are we predestined from birth to heaven or hell, no matter how we exercise our free will throughout life? The Church answered NO! God takes into consideration the exercise of our free will. Indeed, God’s grace works within human freedom, enabling it, not destroying or diminishing it. Before the young Francis came to that same truth a few years later, he experienced a real existential trauma. He truly feared that he might, despite his great love of God, struggle and fall in the future and therefore lose that love for all eternity. He could neither eat nor sleep and those around him feared for his life. The crisis was resolved when he made a perfect act of selfless, disinterested love as paraphrased here: “Even if, in the future, I should fall and fail, at least in the present I will love God!” No matter what lay in the future, the brave teenage was determined to love God now. Love! Now! Those two words, equal in spiritual weight, sum up the whole of Salesian spirituality. The past is over and done. Let us leave it in the forgiving hands of God’s mercy. The future is not yet. Let us entrust it in the loving hands of God’s providence. That leaves us only with the present. In it, let us love now! Hence, the emphasis on the present moment in Salesian spirituality and the compelling invitation to do the good that now presents itself. Yes, I may someday have millions with which to give abundantly to the poor, but this poor woman needs a little cash now with which to buy food for her children. 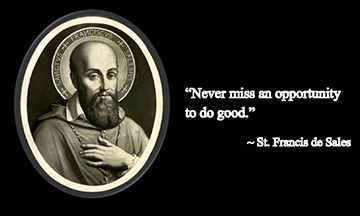 Following the saint’s advice above, we will “never miss an opportunity to do good.” This is now our opportunity for doing good. Let us seize it! All we need to do is apply in our daily lives the simple, short Salesian principle: “Love! Now!” and we will have grasped the essence of Salesian spirituality which, in turn, is nothing other than the fulfillment of the Lord’s double commandment of love!